By the mid 19th century, women’s hair was elaborately dressed with combs, flowers, jewellery, feathers and even fruit and stuffed birds. It took a long time to comb and arrange women’s hair and hairdressers were paid by wealthy customers to go to their houses so that they did not have to visit the shop. 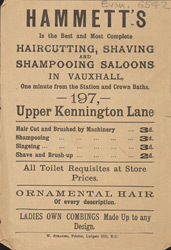 Men visited hairdressing saloons and barbershops to have their hair cut and to have their beards trimmed and faces shaved.